When you have balances on several different credit cards, paying them off can be a long, challenging process. It's hard to make progress paying off your debt when you have to split your payments between say, seven different accounts. Wouldn't it be easier to just pay one bill and take care of all your credit card debt? You can consolidate debt by combining your debt payments and pay off your debt quicker. There are several different ways you can consolidate debt on your own without paying a debt consolidation company. You can use a low rate balance transfer to move your balances onto a single credit card. That's if your credit card has a large enough credit limit. A low credit limit doesn't have to stop you from doing a balance transfer. 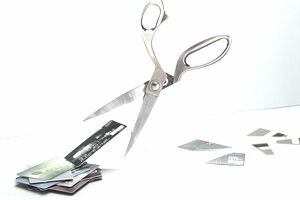 You can transfer just one or two of your highest interest rate credit card balances to ease some of the debt pain. Before you consolidate debt with a balance transfer, make sure you’ll actually be saving money with the transfer. It's not worth it to consolidate debt and end up paying more. You can borrow against the equity in your home using a home equity loan or home equity line of credit and use the loan to pay off your credit card debt. Debt consolidation loans are used solely to combine all your debts. These loans may be offered by major banks or from so-called non-profit debt consolidation companies. Be careful about using debt consolidation companies to consolidate debt. These loans often include extra fees, making the cost of the loan much higher. Avoid borrowing money from one of these companies. Instead, seek out a low interest rate loan from your bank or credit union for better terms and to ensure you're not being scammed. It’s not the most desirable way to consolidate debt, by far, but if have to choose between life insurance loan or bankruptcy, borrowing from your insurance may be best. You can typically borrow up to the cash value of your loan and use the proceeds to consolidate debt. Your insurance company won’t require you to make payments as long as the loan is less than the cash value of the policy, but it’s a good idea to make payments anyway. If you don’t repay the loan, then the death benefit will be used to cover what you borrowed and your survivors may not get anything at all. This is another last resort method you can use to consolidate debt. Most retirement plans allow you to borrow against them, but there are some drawbacks to consolidating with a 401k loan. For starters, the loan has to be repaid in five years or it will be considered an early withdrawal and will be subject to a penalty and income tax. Not only that, if you leave your job the loan will be due within 60 days or you’ll face early withdrawal penalties. Think long and hard before borrowing from your retirement and do it only when the other option is withdrawing from retirement. All these options aren't ideal, particularly life insurance and retirement fund loans, but you should know they exist. Before you consolidate debt, weigh all the options available to you. Understand the risks associated with your debt consolidation method. Finally, make sure you repay the loans you take out to consolidate debt. When you consolidate debt, you're not really paying it off. Instead, you're just moving it around in a way that makes it easier to pay. Shuffling debt could cost more money, take more time, or put your future at risk.